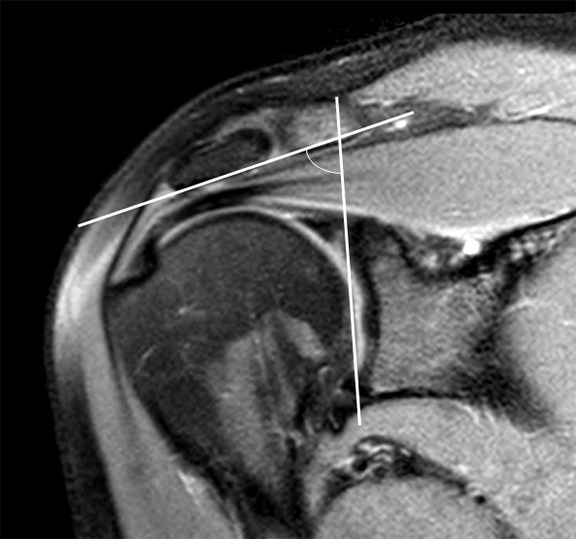 Shoulder pain is a common musculoskeletal medical condition affecting 7% to 26% of individuals and is the third most common musculoskeletal-related complaint in the primary care setting.1,2 Rotator cuff pathology is a common etiology for shoulder pain, with impingement of the rotator cuff often playing an important role. Rotator cuff impingement was first described by Neer et al when he stated that 95% of rotator cuff tears were attributed to impingement and generally occur in patients over age 40.3,4 Two predominant types of shoulder impingement have been described: intrinsic and extrinsic. Extrinsic, or external, impingement is one of the more common causes of shoulder pain and a frequent source for an orthopedic evaluation.8 Extrinsic shoulder impingement is most commonly related to mechanical compression from the acromion, acromioclavicular joint, and the coracoacromial ligament.3,9 Numerous operative and nonoperative treatment options have been described for extrinsic impingement, ranging from physical therapy and injections to acromioplasty and Mumford procedures. 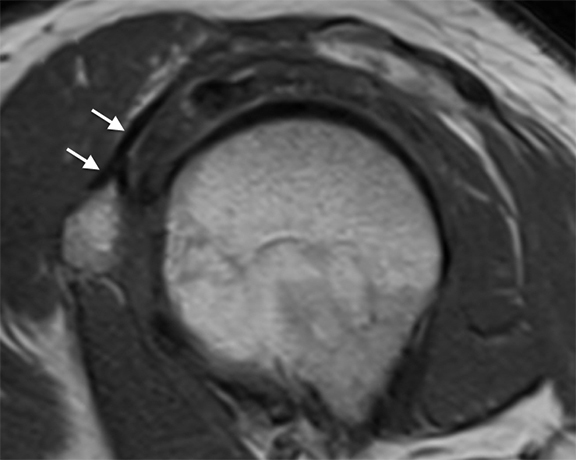 The purpose of this article is to help understand the relevant anatomy with regard to the subacromial region, review the imaging findings, and discuss the differing etiologies of extrinsic impingement. This knowledge will allow radiologists to effectively communicate with clinicians and help guide appropriate treatment. The coracoacromial arch provides a safeguard for the shoulder, limiting superior migration of the humeral head. The coracoacromial arch is composed of (from anterior to posterior) the coracoid process, coracoacromial ligament, and the acromion process. Inferior to these structures, and coursing through the arch, are the subacromial/subdeltoid bursa, supraspinatus tendon, and biceps tendon. The humeral head provides the posterior/inferior border of the arch (Figure 1). Processes that decrease the space within the coracoacromial arch presumably may lead to impingement-like symptoms. Os acromiale represents an accessory ossification center that has not fused by age 25 years. This normal variant occurs in 15% of the population. 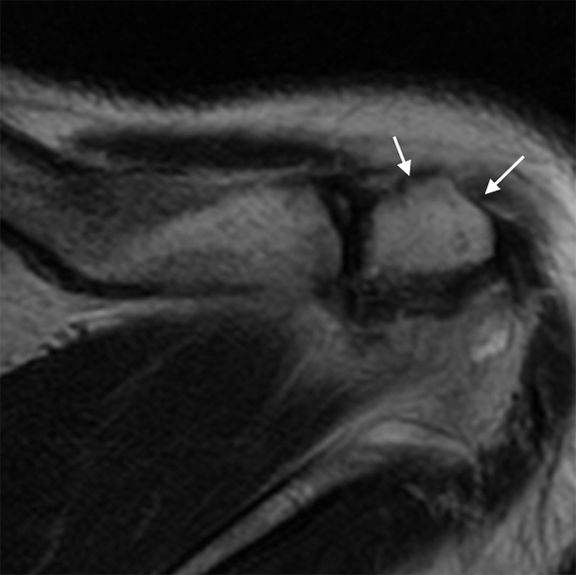 Failure of fusion occurs between 1 of the 3 ossification centers: pre-acromion (Figure 9A), meso-acromion (Figure 9B), and meta-acromion. A classification scheme was proposed by Park et al with subtypes A-G. 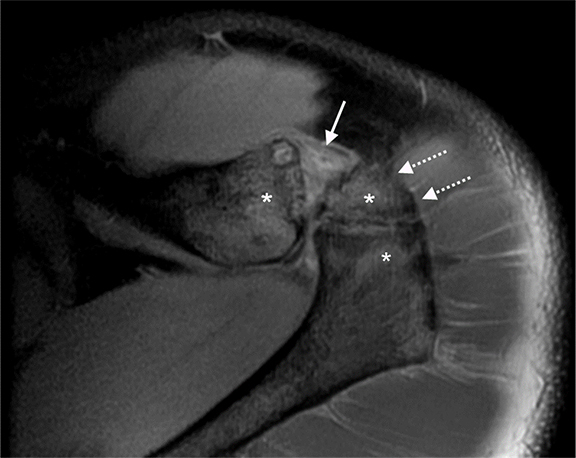 Type A, also known as the meso-acromial or meso-type, is the most common and is a failure of fusion between the meso-acromion and meta-acromion.21 The presence of an os acromiale has been associated with increased incidence of impingement and rotator cuff disease, although is controversial in the literature.21,22 There is suggestion that the os is mobile, and thus reduces the size of the coracoacromial arch during motion. Os acromiale can cause impingement in 2 separate manners: Contraction of the deltoid muscle will force the os acromiale inferiorly, leading to narrowing of the rotator cuff outlet. The other mechanism occurs when osteophytes develop at the margin of the acromial gap, often directly impinging on the rotator cuff. 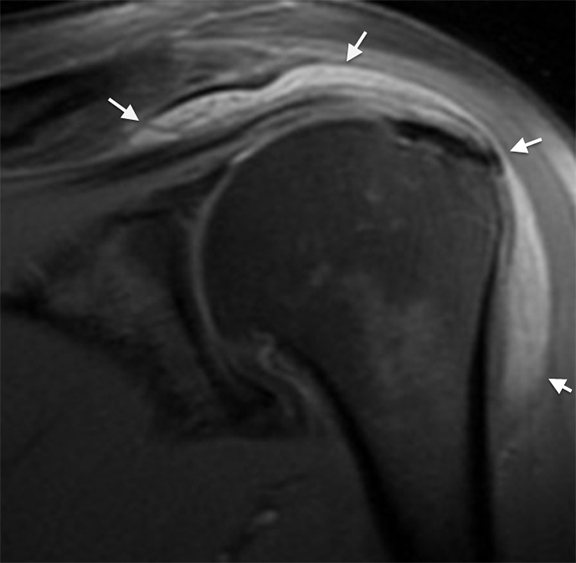 Rotator cuff tendinopathy (or tendinosis) is depicted by thickening and increased signal within the tendons. With tendinopathy, there is no visible discontinuity of tendon fibers and signal does not extend to the articular or bursal surface. Also, signal seen within tendinopathy is hyperintense on fluid-sensitive sequences, but is hypointense compared to nearby intra-articular fluid signal (Figure 11). 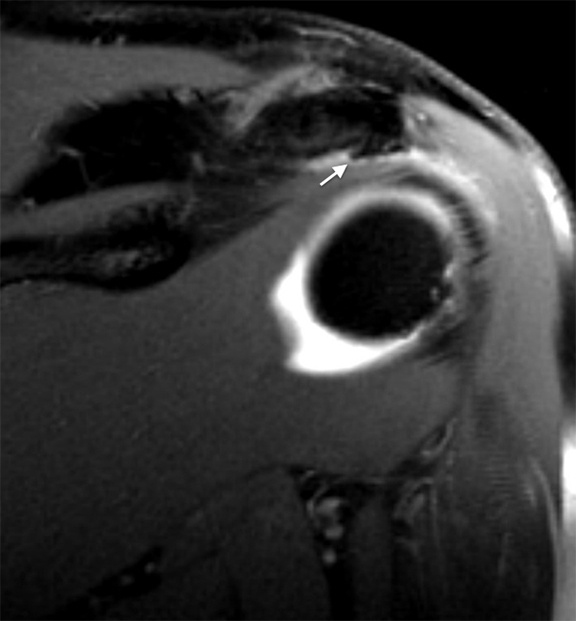 Fluid-like hyperintense signal within the tendon suggests an intrasubstance partial tear. Full-thickness rotator cuff tears are manifested by fluid-like signal within the tendon, which extends throughout the entire substance of the tendon from the articular to the bursal surface (Figure 15). These can be further classified according to size. A widely used system created by DeOrio and Cofield classifies full thickness tears based on their greatest dimension. These are classified as small (< 1 cm), medium (1 to 3 cm), large (3 to 5 cm), or massive (> 5 cm).28 Other important features of full-thickness tears are the degree of tendon retraction and presence or absence of muscle atrophy. 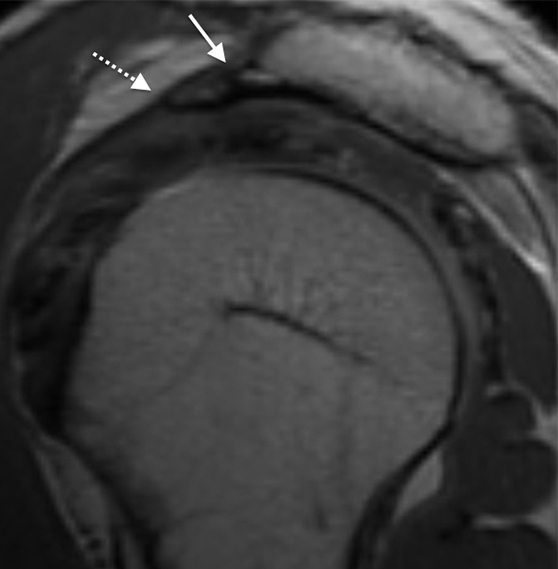 A tendon retracted medial to the glenoid has historically indicated that the tendon tear is not amenable to repair (Figure 16).29 Muscle atrophy in association with a full-thickness tear of the supraspinatus or infraspinatus tendons suggests that the muscle has lost its ability to contract and may not be successfully treated with surgery.30 This information is of clinical value to the surgeon when deciding whether to repair the tear. MR characteristics of impingement have been subsequently grouped into subtypes by Seeger et al.31 Type I impingement is noted as the least severe and includes subacromial bursitis and bursal thickening with normal signal intensity of the supraspinatus tendon. 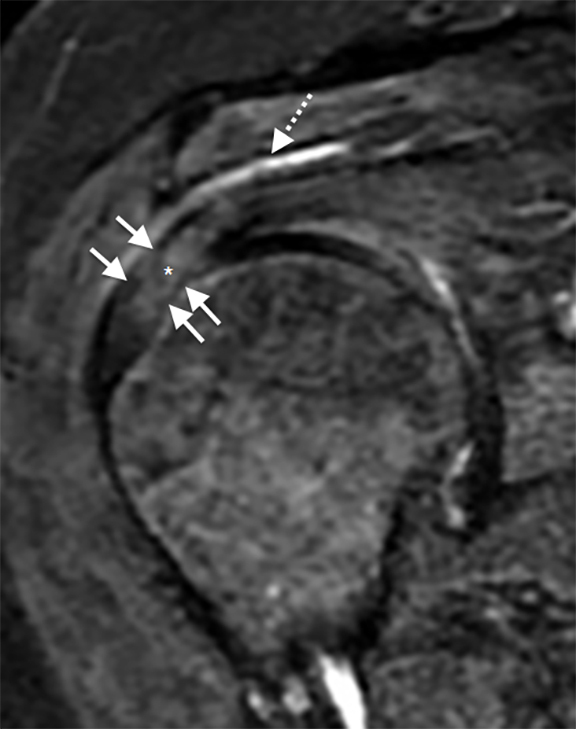 Type II impingement is classified as abnormally high-signal in the supraspinatus tendon without abnormal intramuscular signal or tendon retraction. 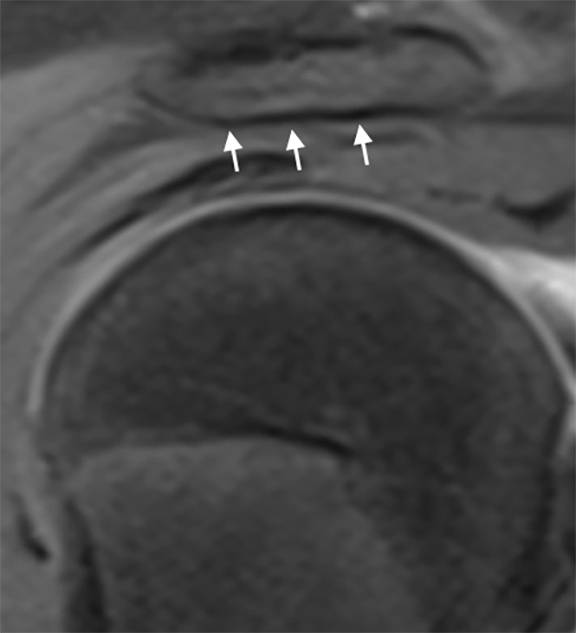 Type III impingement findings include full-thickness abnormal signal intensity with muscle retraction, indicating a full-thickness tear. Extrinsic shoulder impingement is a common cause of shoulder pain and frequently seen in clinical practice. Imaging plays an important role in identifying the cause of impingement and also in guiding clinicians with treatment planning. Understanding the anatomy, underlying mechanics, and MRI characteristics of rotator cuff impingement will allow for prompt recognition and ultimately improve outcomes. Luime JJ, Koes BW, Hendriksen IJM, et al. Prevalence and incidence of shoulder pain in the general population; a systematic review. Scand J Rheumatol 2004;33(2):73-81. Urwin M, Symmons D, Allison T, et al. Estimating the burden of musculoskeletal disorders in the community: the comparative prevalence of symptoms at different anatomical sites, and the relation to social deprivation. Ann Rheum Dis 1998;57(11):649-655. Neer CS. Impingement lesions. Clin Orthop Relat Res 1983;173:70. Wolff AB, Sethi P, Sutton KM, et al. Partial thickness rotator cuff tears. J Am Acad Orthop Surg 2006;14(13):715. Budoff JE, Nirschl RP, Ilahi OA, et al. Internal impingement in the etiology of rotator cuff tendinosis revisited. Arthroscopy 2003;19(8):810-814. Giaroli EL, Major NM, Higgins LD. 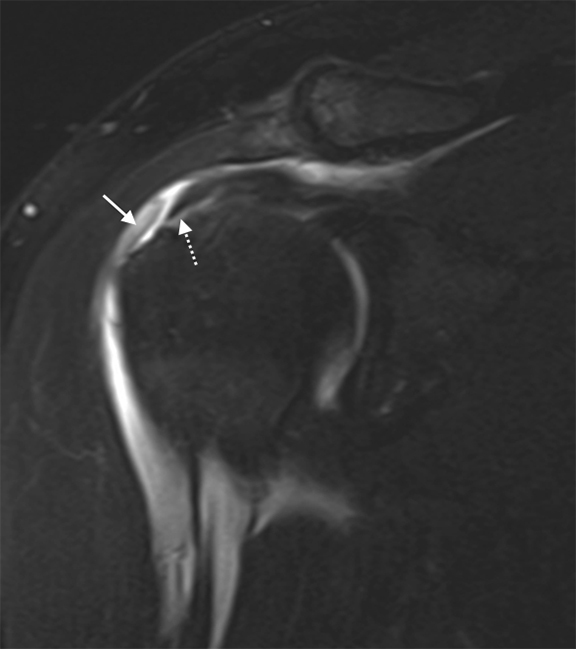 MRI of internal impingement of the shoulder. Am J Roentgenol 2005;185(4):925-929. Muto T, Inui H, Ninomiya H, et al. Characteristics and clinical outcomes in overhead sports athletes after rotator cuff repair. J Sports Med 2017;2017:5476293. Seitz AL, McClure PW, Finucane S, et al. Mechanisms of rotator cuff tendinopathy: intrinsic, extrinsic, or both? Clin Biomech 2011;26(1):1-12. Neer CS 2nd. Anterior acromioplasty for the chronic impingement syndrome in the shoulder: a preliminary report. J Bone Joint Surg Am 1972;54(1):41-50. Standring S. Gray’s Anatomy E-Book: The Anatomical Basis of Clinical Practice. Amsterdam, Netherlands: Elsevier Health Sciences; 2015. Matsen FA. Shoulder Surgery: Principles and Procedures. Philadelphia, PA: Saunders; 2004. Edelson JG, Luchs J. Aspects of coracoacromial ligament anatomy of interest to the arthroscopic surgeon. Arthroscopy 1995;11(6):715-719. Gallino M, Battiston B, Annaratone G, et al. 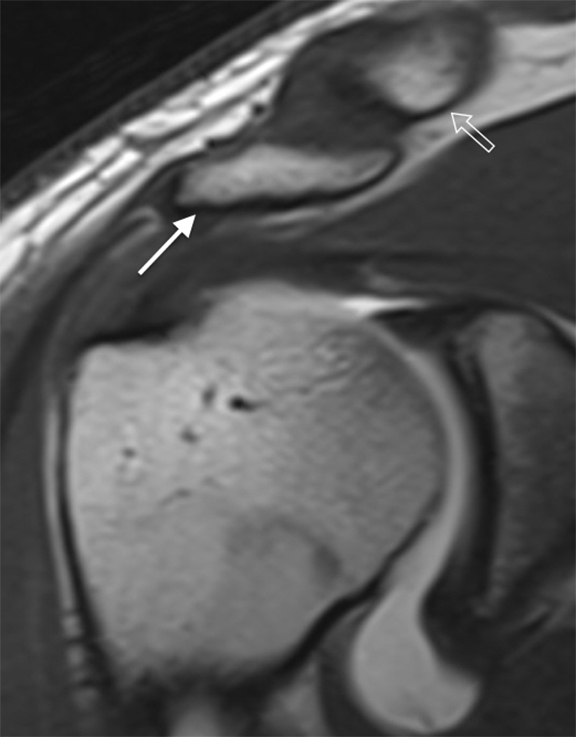 Coracoacromial ligament: a comparative arthroscopic and anatomic study. Arthroscopy 1995;11(5):564-567. Scheuer L, Black S, Christie A. The pectoral girdle. San Diego, CA: Elsevier Academic Press; 2000. Flecker H. Roentgenographic observations of the times of appearance of epiphyses and their fusion with the diaphyses. J Anat 1932;67(Pt 1):118-164.3. Rockwood CA, Lyons FR. 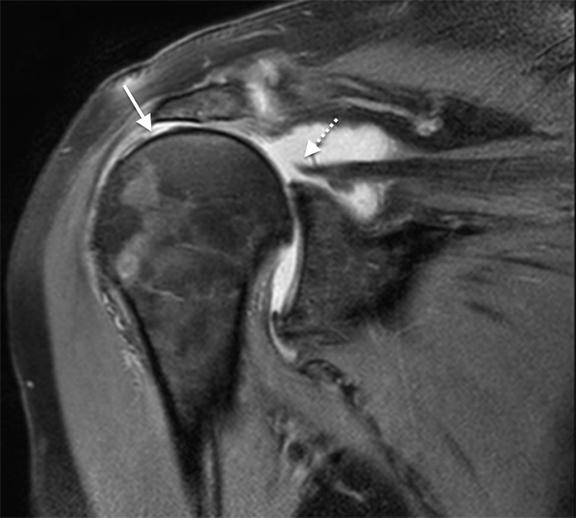 Shoulder impingement syndrome: diagnosis, radiographic evaluation, and treatment with a modified Neer acromioplasty. J Bone Joint Surg Am 1993;75(3):409-424. Michener LA, McClure PW, Karduna AR. Anatomical and biomechanical mechanisms of subacromial impingement syndrome. Clin Biomech 2003;18(5):369-379. Bigliani LU, D’Alessandro DF, Duralde XA, et al. 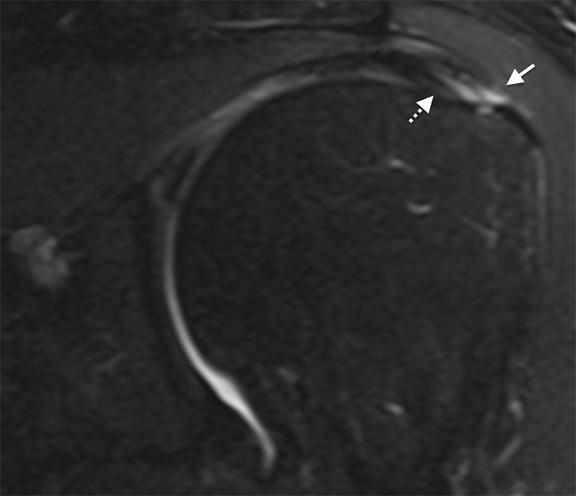 Anterior acromioplasty for subacromial impingement in patients younger than 40 years of age. Clin Orthop Relat Res 1989;(246):111-116. Farley TE, Neumann CH, Steinbach LS, et al. 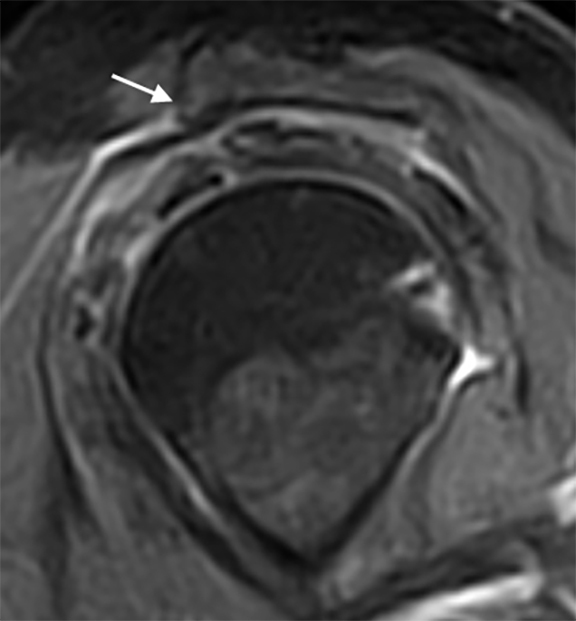 The coracoacromial arch: MR evaluation and correlation with rotator cuff pathology. Skeletal Radiol 1994;23(8):641-645. Balke M, Schmidt C, Dedy N, et al. 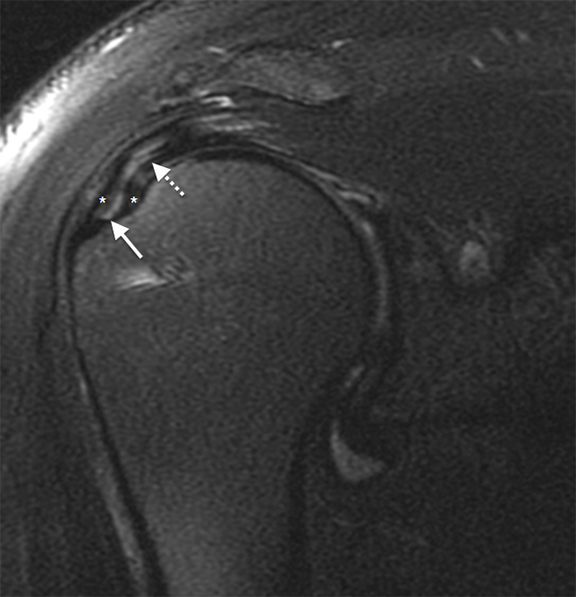 Correlation of acromial morphology with impingement syndrome and rotator cuff tears. Acta Orthop 2013;84(2):178-183. 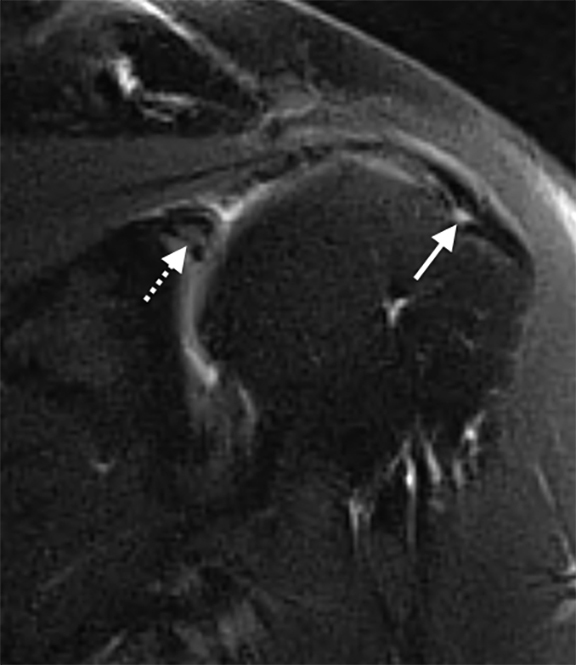 Park JG, Lee JK, Phelps CT. Os acromiale associated with rotator cuff impingement: MR imaging of the shoulder. Radiology 1994;193(1):255-257. Rovesta C, Marongiu MC, Corradini A, et al. 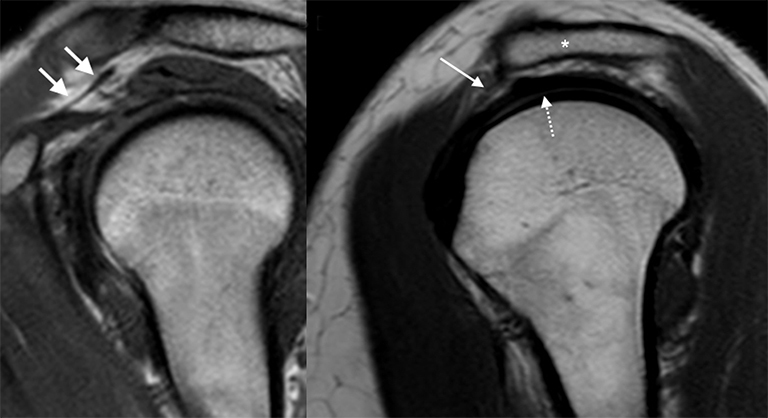 Os acromiale: frequency and a review of 726 shoulder MRI. Musculoskelet Surg February 2017. doi:10.1007/s12306-017-0463-2. De Yang Tien J, Tan AHC. Shoulder impingement syndrome, a common affliction of the shoulder: a comprehensive review. Proc Singapore Healthcare 2014;23(4):297-305. Umer M, Qadir I, Azam M. Subacromial impingement syndrome. Orthop Rev 2012;4(2):e18. Vinson EN, Helms CA, Higgins LD. Rim-rent tear of the rotator cuff: a common and easily overlooked partial tear. Am J Roentgenol 2007;189(4):943-946. Ellman H. Diagnosis and treatment of incomplete rotator cuff tears. Clin Orthop Relat Res 1990;254:64. Weber SC. Arthroscopic debridement and acromioplasty versus mini-open repair in the treatment of significant partial thickness rotator cuff tears. Arthroscopy 1999;15(2):126-131. DeOrio JK, Cofield RH. Results of a second attempt at surgical repair of a failed initial rotator-cuff repair. J Bone Joint Surg Am 1984;66(4):563-567. Thomazeau H, Boukobza E, Morcet N, et al. 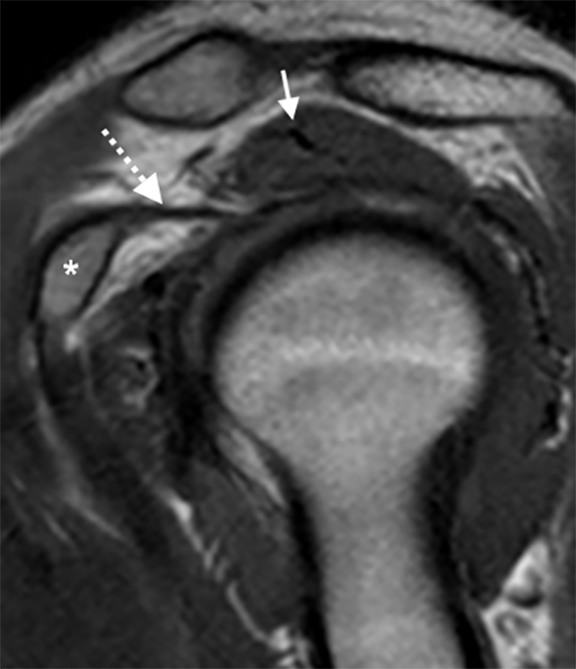 Prediction of rotator cuff repair results by magnetic resonance imaging. Clin Orthop Relat Res 1997;(344):275-283. Maughan RJ, Watson JS, Weir J. Strength and cross-sectional area of human skeletal muscle. J Physiol 1983;338:37-49. Seeger LL, Gold RH, Bassett LW, et al. Shoulder impingement syndrome: MR findings in 53 shoulders. Am J Roentgenol 1988;150(2):343-347. Ogata S, Uhthoff HK. Acromial enthesopathy and rotator cuff tear. A radiologic and histologic postmortem investigation of the coracoacromial arch. Clin Orthop Relat Res 1990;(254):39-48. Snyder JS. Rotator cuff: introduction, evaluation, and imaging. Shoulder arthroscopy, 2nd ed Lippincott Williams & Wilkins. 2003. Oh JH, Kim JY, Lee HK, et al. Classification and clinical significance of acromial spur in rotator cuff tear: heel-type spur and rotator cuff tear. Clin Orthop Relat Res 2010;468(6):1542-1550. Bigliani LU, Ticker JB, Flatow EL, et al. The relationship of acromial architecture to rotator cuff disease. Clin Sports Med 1991;10(4):823-838. Tuite MJ, Toivonen DA, Orwin JF, et al. Acromial angle on radiographs of the shoulder: correlation with the impingement syndrome and rotator cuff tears. Am J Roentgenol 1995;165(3):609-613. Kurtz CA, Humble BJ, Rodosky MW, Sekiya JK. Symptomatic os acromiale. J Am Acad Orthop Surg 2006;14(1):12-19. Stoller DW. Magnetic Resonance Imaging in Orthopaedics and Sports Medicine. Philadelphia, PA: Lippincott Williams & Wilkins; 2007. Rothenberg A, Gasbarro G, Chlebeck J, et al. The coracoacromial ligament: anatomy, function, and clinical significance. Orthop J Sports Med 2017;5(4):2325967117703398. Burns WC 2nd, Whipple TL. Anatomic relationships in the shoulder impingement syndrome. Clin Orthop Relat Res 1993;(294):96-102. Dong W, Goost H, Lin X-B, et al. Treatments for shoulder impingement syndrome: a PRISMA systematic review and network meta-analysis. Medicine 2015;94(10):e510. Rob J. Does the addition of a corticosteroid injection to exercise therapy improve outcomes in subacromial impingement syndrome? Clin J Sport Med 2011;21(5):463-464. Sachs RA, Stone ML, Devine S. Open vs. arthroscopic acromioplasty: a prospective, randomized study. Arthroscopy 1994;10(3):248-254. Davis AD, Kakar S, Moros C, et al. Arthroscopic versus open acromioplasty. Am J Sports Med 2010;38(3):613-618. Su W-R, Budoff JE, Luo Z-P. The effect of coracoacromial ligament excision and acromioplasty on superior and anterosuperior glenohumeral stability. Arthroscopy 2009;25(1):13-18. Donigan JA, Wolf BR. Arthroscopic subacromial decompression: acromioplasty versus bursectomy alone—does it really matter? A systematic review. Iowa Orthop J 2011;31:121-126. Lesko PD. Arthroscopic Mumford procedure variation of technique. Iowa Orthop J 1999;19:93-98. Daluga DJ, Dobozi W. The influence of distal clavicle resection and rotator cuff repair on the effectiveness of anterior acromioplasty. Clin Orthop Relat Res 1989;(247):117-123. Barbier O, Block D, Dezaly C, et al. Os acromiale, a cause of shoulder pain, not to be overlooked. Orthop Traumatol Surg Res 2013;99(4) :465-472. 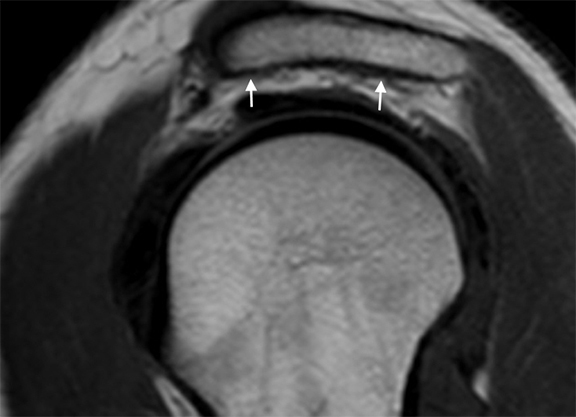 Smith CP, Vassiliou CE, Pack JR, von Borstel D. Shoulder Impingement and Associated MRI Findings. J Am Osteopath Coll Radiol. 2018;7(3):5-14. Cameron P. Smith, D.O., Christos E. Vassiliou, D.O., Jason R. Pack, M.D., Donald von Borstel, D.O. Dr. Smith, Dr. Vassiliou, Dr. Pack, and Dr. von Borstel work with the Department of Radiology, Oklahoma State University Medical Center, Tulsa, OK.